Blend fruit and peppers in food processor, pulsing until combined. transfer to bowl. Add sugar, juice, and zest. stir until well combined. serve with chips. **thanks Anna for the great recipe...I'm passing it on, hope you don't mind! BEST SALSA EVER!!!! 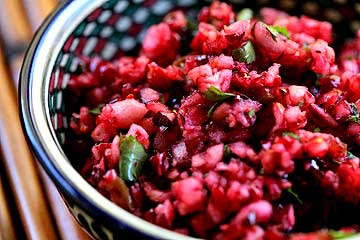 Thanksgiving isn't Thanksgiving until you break out the cranberry salsa....I'm glad you like it!